I love fish – when other people cook it. I can do shrimp, calamari and other bites of seafood you might put into a stir-fry, but the results from my attempts to cook fillets of fish have been mediocre at best. 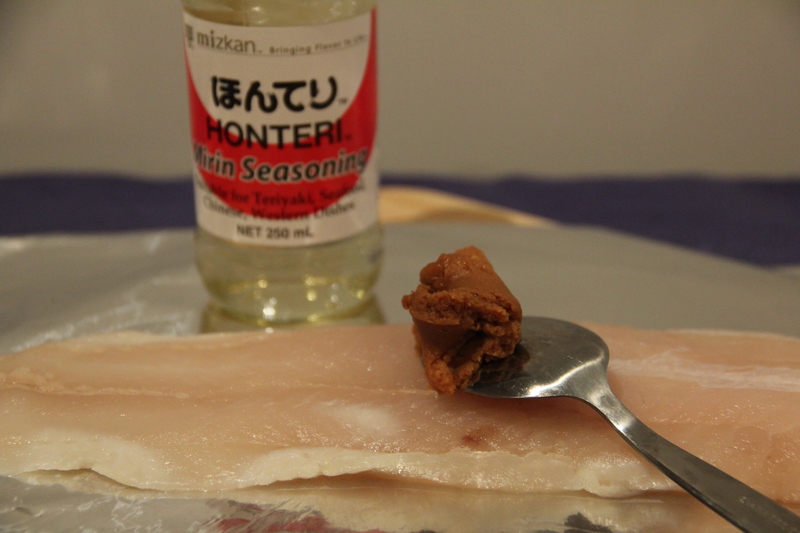 So when a co-worker suggested I cook fish in miso paste and mirin a few weeks ago, I thought, why not? 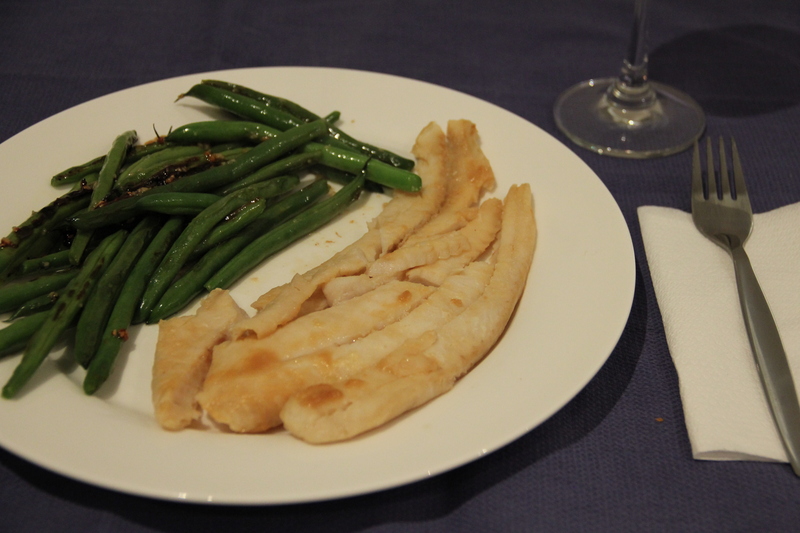 It certainly can’t be any worse than the other fish I have cooked (and eaten). But the outcome wasn’t mediocre – it was delicious! Without a doubt the best fish I have ever cooked (which may not be a great distinction, but I promise, it is really good!). I immediately thought that I needed to share this unbelievably easy, healthy, and tasty dish with others. I hope you enjoy it as much as I do! Place the fish on a large piece of aluminum foil coated with non-stick cooking spray. 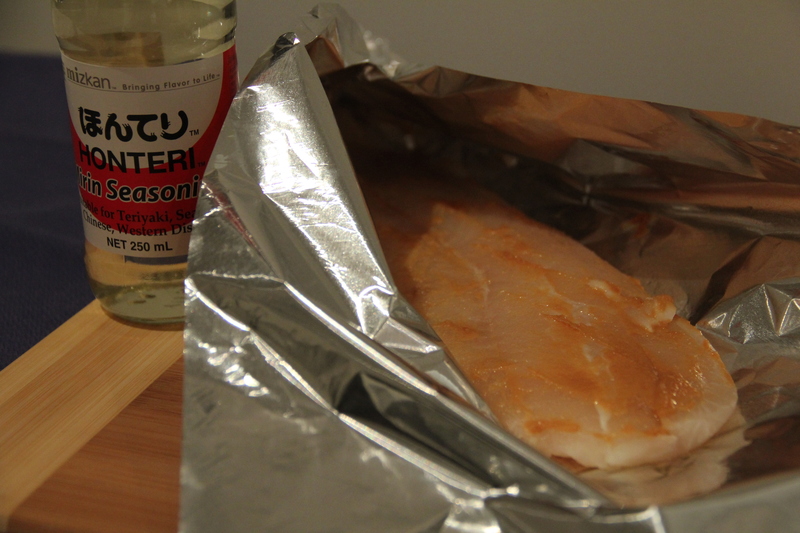 Using the backside of a spoon, spread a very thin layer of miso paste over the entire fish. Make sure to smooth out any areas where they miso may have collected – a mouthful of miso is not appetizing! Splash enough mirin on the fish to coat it, but not so much to leave it swimming in a puddle of the liquid. Fold the ends of the aluminum foil together to envelope the fish in its own personal baking pocket. Bake at 400 F for 10-15 minutes or until flaky and cooked through. Open the foil carefully to avoid getting burned by the steam. Voila – you have dinner! To keep the dish super healthy, serve with green beans or asparagus cooked in olive oil, garlic, salt, and splash of mirin. The mirin will caramelize as it cooks in the pan, giving the veggies a slightly sweet flavor. If you’re looking for something a little fancier, serve the fish with Black Sesame Asparagus using this recipe from Set The Table. If you’re hungry, add another side dish of sweet potatoes roasted with olive oil, garlic, salt, and cayenne pepper. 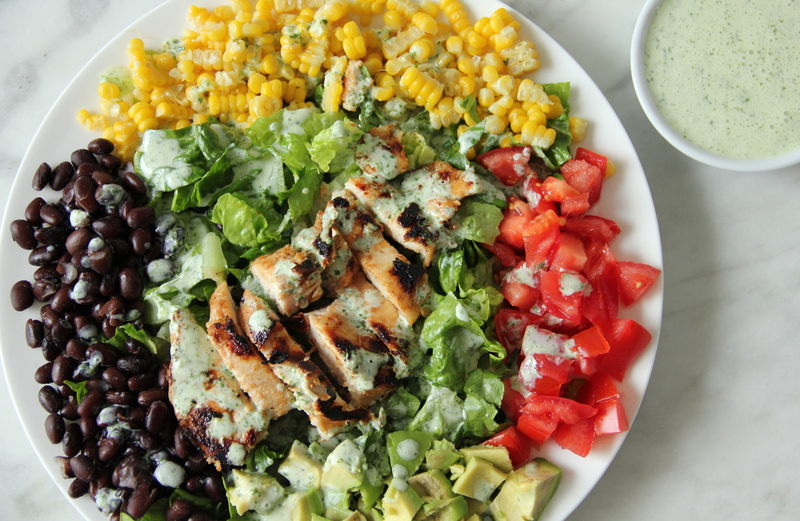 Still healthy, still delicious! Enjoy! *Mirin is a type of sweet rice wine used in Japanese cooking. In Melbourne, I can find it in the Asian section of the grocery store. I’m hoping I will be able to find in there in the U.S. as well! The weather is cooling down in Melbourne. I turned my heat on for the first time last week (I thought my adventures with appliances were over after living in my apartment for six months, but after several attempts to turn the temperature up and still have the air con spit out streams of cold air, I ended up searching online for the user manual and discovering there was a whole section of the remote control I didn’t even know existed! One press of a button and presto – heat! So simple.). The change in weather likewise brings changes to my diet. Two weeks ago I made chili. 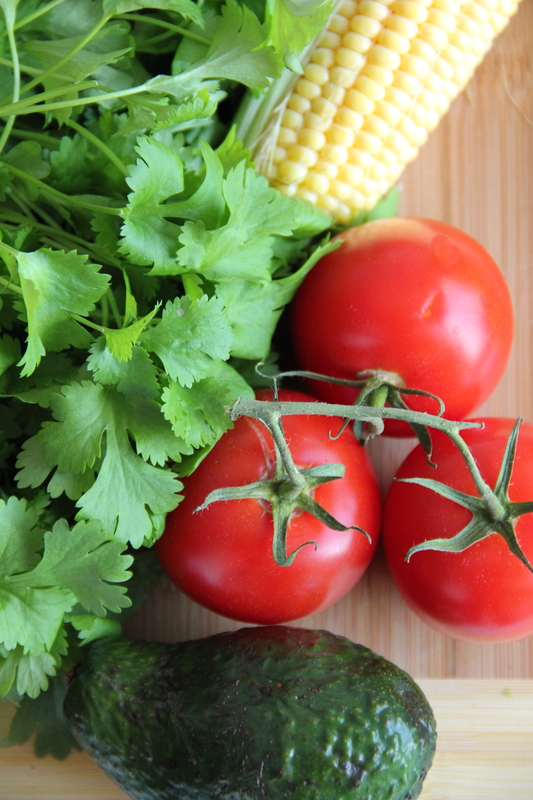 Last night I made Mexican-inspired tacos using this recipe from Ambitious Kitchen. I now keep soup stocked in my cupboard for those days I don’t feel like cooking and need something healthy to eat. And so it goes for breakfast. What is better than waking up on a chilly morning and consuming a warm bowl of gooey oatmeal and a cup of tea or coffee? The fact that oatmeal is quick, easy, and healthy makes it even better! After years of making oatmeal in the microwave, I recently uncovered the deliciousness of cooking oats on the stove. I don’t know what happens on the stove vs in the microwave, but the resulting texture is creamy, thick, smooth, and simply amazing. 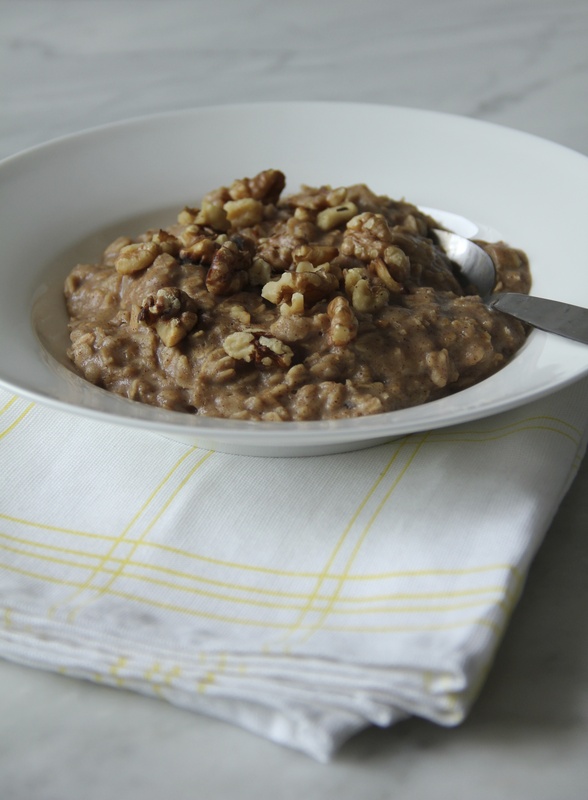 Peanut Butter Banana: Mix ½ cup regular (not quick) oats with ½ cup soy milk and ½ water in a small saucepan. Turn the stove to medium heat. When the mixture begins to boil and thicken, turn down the heat and add 1 sliced banana, 1 heaped teaspoon peanut butter, ½ teaspoon cinnamon, and a dash of salt. Add more liquid to reach desired consistency. Blueberry Banana: Mix ½ cup regular oats with 1 cup water and ½ cup frozen blueberries in a small saucepan. Turn the stove to medium heat. Similar to the first recipe, when the mixture starts to thicken, add ½ sliced banana, ½ teaspoon cinnamon, and a dash of salt. Add liquid as desired and top with toasted slivered almonds. Apple Raisin Spice: This is my favorite! Mix ½ cup regular oats with ½ cup water, ½ cup soy milk and one diced apple in a small saucepan. Make sure to chop the apple into fairly small pieces if you want them to be soft in the final product. As the mixture starts to boil add ½ teaspoon cinnamon, a dash of allspice, and a dash of salt. When your oatmeal is ready, stir in 1/8 cup raisins. Top with chopped toasted walnuts and relish every bite! I highly recommend that you cook oats on the stove (it only takes about 2 minutes longer than the microwave and is SO much better), but if you’re really in a time crunch, any of these recipes can be made in the microwave. If using frozen fruit or an apple be sure to cook them with the oats and liquid for four minutes to ensure they are hot and soft. I recommend stirring in the banana at the halfway point in cooking otherwise it will become complete mush. But please try the stovetop method – you will be amazed at the difference and want to eat oatmeal every morning! I am a fantastic modifier. Give me an essay and I will edit it magnificently. Hand me a deck of training materials and I will adapt them to fit the needs of the audience. I scour websites to combine recipes and tweak them to my liking. But creating something entirely new from only my instinct and imagination? That is not my forte. But this time I decided to try something different. In the U.S. pumpkin is served as pie or maybe soup and generally in the autumn during harvest. In Australia pumpkin is the generic term for many types of orange and yellow squashes and is served all year around in everything from curry to salad to pizza. It’s delicious! A few weeks ago I had spicy roasted pumpkin at a restaurant and decided I wanted to make it myself. Instead of looking for a recipe online, I decided to throw caution to the wind and throw together ingredients I conjectured to be a good combination. I created a dressing of chilis minced in the food processor, honey, and cinnamon. I basted the pumpkin, stuck it in the oven at 400 and waited to see what would happen. My apartment smelled delicious as the pumpkin was baking. Unfortunately, though, the honey melted off the pumpkin, taking the chili with it, and burnt to a crisp on the bottom of the pan. The pumpkin itself was still edible, but not as spicy as I wanted, way too sweet, and very much in need of salt. Cut the pumpkin into slices like you would a melon. Discard the seedy flesh from the middle of each slide. Cut the slices into similar-sized pieces approximately 2×2 inches. The pieces won’t be exactly uniform, but making them about the same size will ensure even cooking. There is no need to remove the skin. It will be very easy to cut the skin away from the meat once the pumpkin is cooked. I used a Kent Japanese pumpkin, but I think you could use a wide variety of pumpkins, including the common butternut squash and acorn squash. Place your pieces of pumpkin in a single layer into a 13×9 pan coated with nonstick cooking spray. 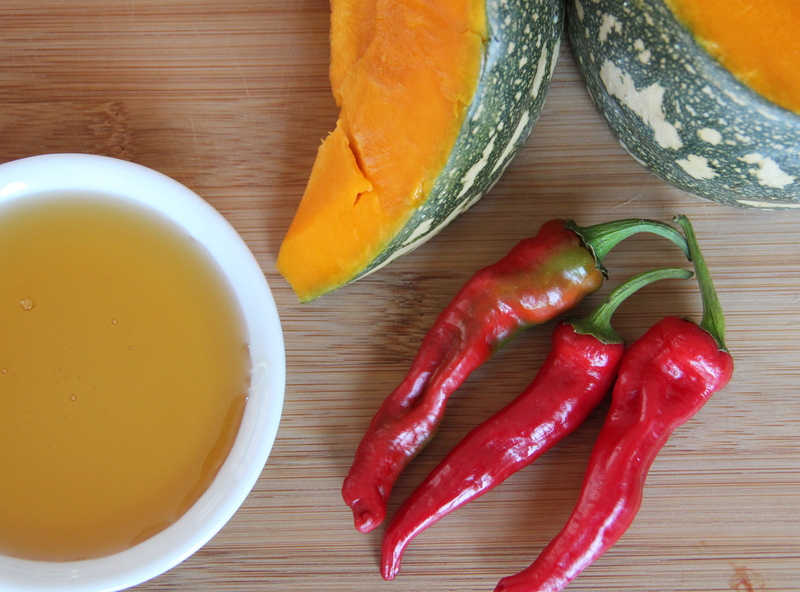 Mix the honey, olive oil, ginger, and chili in a small bowl. Add cayenne pepper to give the mix as much or as little kick as you would like. Baste each piece of pumpkin and finish by sprinkling salt over the entire dish. Bake at 400 degree for 30-40 minutes, testing the tenderness of the pumpkin at 30 minutes by piercing one of the pieces with a fork. I prefer the pumpkin cooked very well, but not yet mushy, so I cook it 35-40 minutes. Cook less for firmer pumpkin, more for mushy, sweet pumpkin. I ate the pumpkin this week with sautéed green beans and chicken in a Thai marinade. It was a great combination. 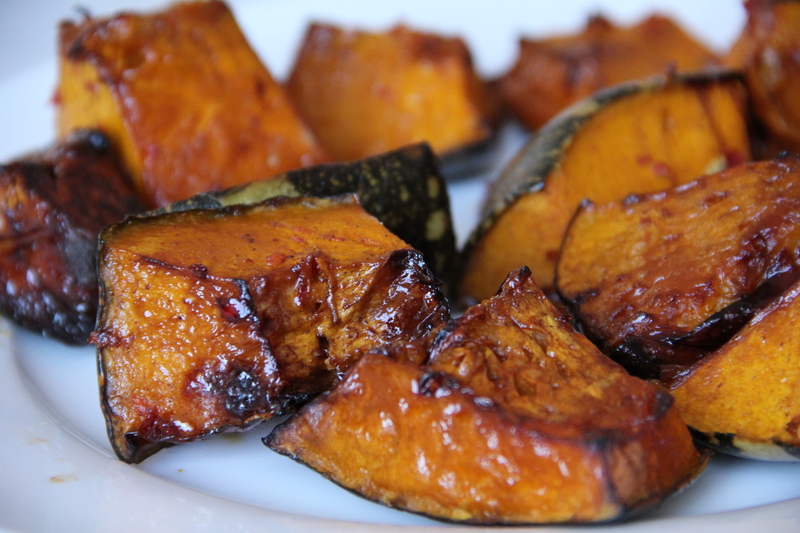 Pumpkin is very versatile and this recipe could be altered to your liking – I tried garam masala, olive oil, and salt later in the week and it was also great! Be creative! Let me know what works for you! I can take no credit for this recipe. My mom started making it years ago and I have no idea where she got it. But it is so delicious that it needs to be shared. Combine oil, lemon juice, garlic, and rosemary. Place all vegetables except the pepper into a 13×9 inch pan, drizzle dressing, toss to coat and add salt and pepper as desired. Roast uncovered at 450 degrees for 30 minutes. 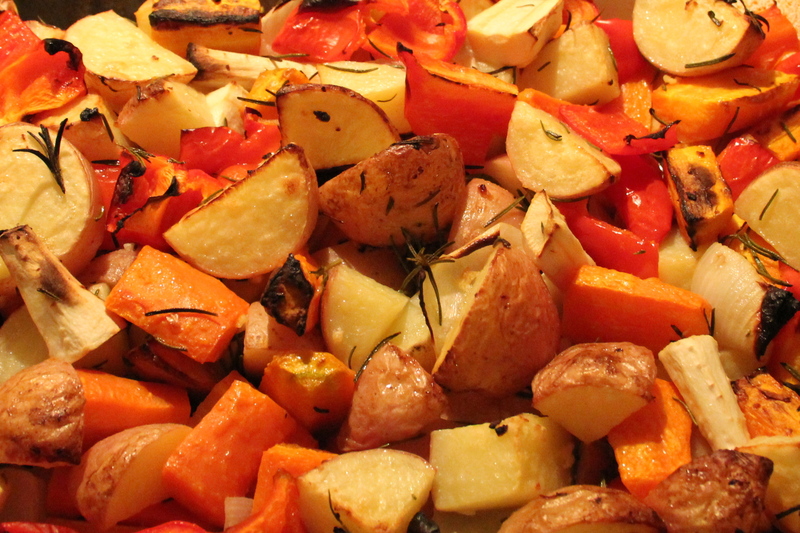 Add red pepper, toss vegetables to mix, and return to oven for 10-15 minutes or until potatoes are fully cooked. Serve immediately. Mix up the flavors of the dish by adding vegetables such as parsnips, rutabaga, zucchini, or snow peas. Substitute oregano for the rosemary for a twist or add a sprinkle cayenne pepper for a little kick. This is a great side dish for nearly any kind of meat. Tonight I ate it with chicken koftas I purchased from my local market, but my favorite combination is with pork tenderloin and mustard sauce. Yum! 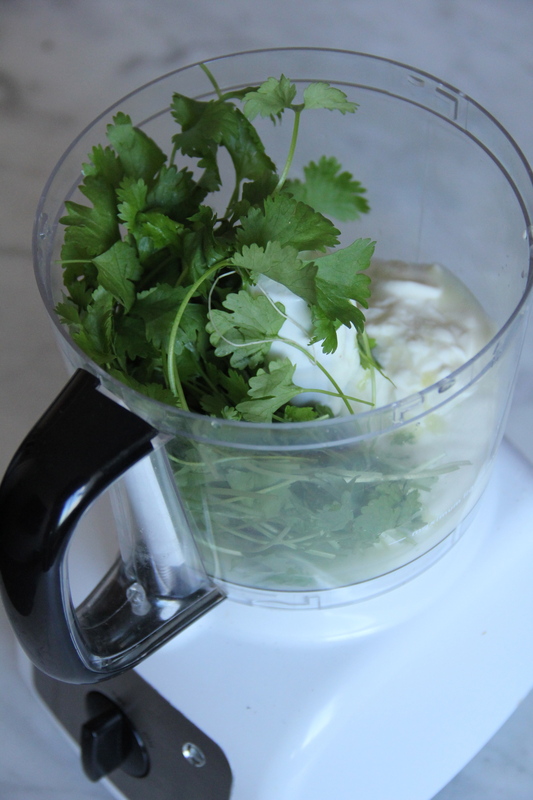 Combine all ingredients in a blender or food processor and blend until smooth. 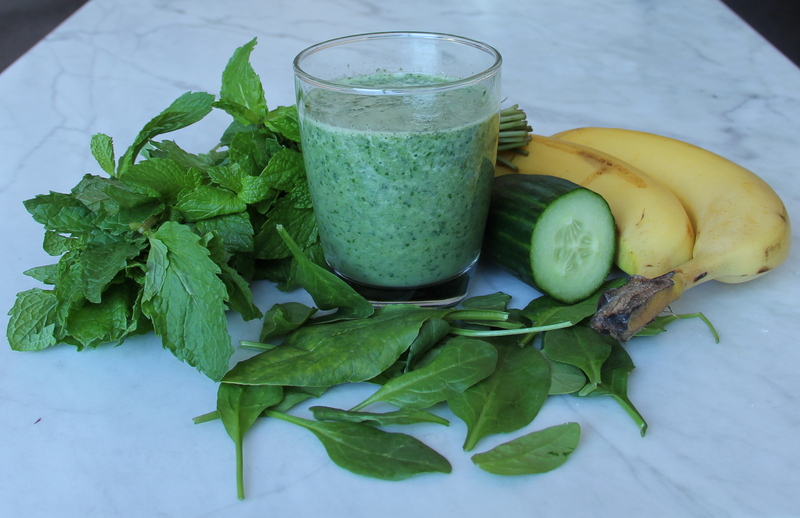 I like to make this smoothie ahead of time and then put it in the refrigerator overnight for a quick breakfast. If you plan to drink the smoothie right away either use a frozen banana or add a few cubes of ice so it’s cold. Enjoy!